Author Denise MillerPosted on September 30, 2013 September 30, 2013 Leave a comment on How’s the Challenge? It’s that time of year again! Many of you have or will soon begin a new school year. Maybe you’ve decided that this year you’re going to do something exciting, something you have never done before with you students. Consider participating in the Exploration Design Challenge. Students around the world are proposing solutions for astronauts who will be exposed to radiation on long-duration missions. This challenge is for students in grades K-12. If you’ve never participated in a NASA challenge, it may seem intimidating. NASA has a solution to help alleviate your fears. The Aerospace Education Services Project is offering three different webinars on the engineering design process. On Aug. 26 and Sept. 9, you can participate in the online seminar “The Engineering Design Process: Part 1– Ask, Imagine, Plan.” According to the AESP site, participants learn about problem identification, brainstorming and design challenges using the “Spaghetti Anyone?” tower building activity. On Aug. 29, “Part 2 — Create, Experiment, Improve” will be offered. In this hands-on webinar, you will learn about the build, test and evaluate, redesign, and share-the-solution steps of the engineering design process. AESP education specialists facilitate these free NASA webinars. You will not need any special software or equipment to participate. Simply go to the meeting room website listed on the AESP Webinar site to participate. To join the challenge, go to the EDC website and register your students for the Exploration Design Challenge. Participating students and their sponsors will become a part of history as their names are sent on the test flight of the Orion Multi-Purpose Crew Vehicle. This is your opportunity to join in making history! What’s one of the most exciting things going on this year with NASA Education? The answer is the NASA Exploration Design Challenge! If you haven’t heard the news, the challenge asks students to think of a solution for protecting astronauts from radiation. In my opinion, this is a cool, relevant way to involve teams of students in science, technology, engineering and mathematics. Why should you consider participating with your class, homeschool, troop or club? Here are my top reasons. 9. Students will think like scientists and solve problems like engineers in this real-world STEM problem. 8. Teams will join an activity in which students from more than 30 countries are participating. 7. Resources include standards-based activities, background information, safety procedures and videos for students in K-12. 6. Looking for answers to a real-world problem can be a powerful learning experience. Why Should Students Get Involved With the NASA Exploration Design Challenge? Kelvin Kirby explains. Kirby is deputy director for the Center for Radiation Engineering and Science for Space Exploration at Prairie View A&M University in Texas. 5. Students learn about Orion, NASA’s next spacecraft for human explorers. 4. Team members and their sponsors will be a part of history as their names will be stored in the Smithsonian Institute as Orion’s virtual crew. 3. EDC motivates students toward STEM careers they may not have considered. 2. Winning high school teams will be invited to the inaugural launch of Orion. 1. Participants will serve as honorary, virtual crew members for Orion’s Exploration Flight Test-1! The challenge has already begun. But it’s not too late to … Plan to kick off your 2013-2014 school year in an exciting way by involving your students. High school students must submit their solutions by Jan. 14, 2014. All others must register for the virtual crew by March 14, 2014. NASA Education has hundreds of lesson plans and classroom activities that enhance the practical application of science, technology, engineering and mathematics, or STEM. These lessons can be used at anytime. But on occasion, NASA Education offers special opportunities that involve your students in NASA’s mission. The newest opportunity is the Exploration Design Challenge. Students around the world from grades K-12 are invited to research and design ways to protect astronauts from space radiation. After students complete the activities, their teacher registers the students on the Exploration Design Challenge site and downloads their certificates of participation. Students who participate will have their names flown on the test flight of the new Orion spacecraft next year. to participate in the NASA Exploration Design Challenge. If you have never been involved in a NASA challenge before, the EDC is a good place to start. You may have time this summer to plan and prepare for participation in the 2013-2014 school year. The EDC site has videos, downloadable guides with background information, safety procedures and data collection charts. Join teachers and students from more than 30 countries in the Exploration Design Challenge. How often has someone who is not an educator told you, “I wish I were a teacher so I could have summers off”? Who has summers off?! As a teacher, I usually taught summer school, took classes or participated in professional development. Then I would plan for the upcoming year. Summers off? Probably not. As you’re planning your summer, consider learning how to create a podcast with students. 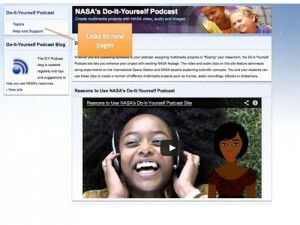 The Do-It-Yourself Podcast tutorial videos allow for on-demand professional development. Watch the videos when you have time. 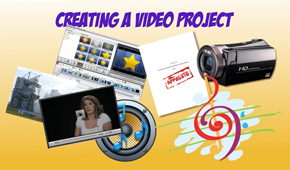 Follow the steps to create an audio or video file. Pause, rewind, and replay the video at your own pace to follow along. Happy summer! I hope you do have time to relax and enjoy it! Learn How to Make Podcasts! I’m excited to introduce the DIY Podcast Tutorials! 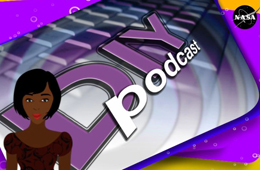 After months of work, we are proud to roll out a series of videos to assist you with using the DIY Podcast site. The series consists of six videos that begin with answering the question “What is a podcast?” and end with demonstrating how to make audio and video podcast files with the DIY Podcast resources. Watch the processes of creating podcast files and start using technology in the classroom. Career planning can be fun for students. They can dream about their futures as they create a multimedia project with the Exploration Careers module. The experts featured in the clips tell interesting stories about their careers at NASA. But with NASA’s Digital Learning Network™, students can speak with NASA experts via a videoconference. • The many careers at NASA. • The difference between a job and a career. • What does an engineer do? • What does NASA look for in its workforce? The event has pre- and post-conference activities to prepare for and follow up after the event. Schedule a DLN event now.